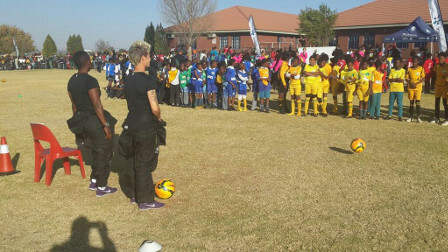 Sasol Banyana Banyana took time off from their busy schedule on Wednesday afternoon, 04 June to conduct coaching clinics to leaners at Credo Primary School in Zamdela Township, Sasolburg. As part of their CSI initiative, Sasol invited Banyana Banyana to spend the afternoon with the leaners, teaching them football skills. The team was welcomed by more than two hundred leaners, both male and female from the different schools in the area. Sasol Banyana Banyana coach, Vera Pauw and the players took the leaners through football drills and some small sided games. “The welcome we received at the school was overwhelming, it shows the kind of support we have in Sasolburg. It is always great to give back to the communities across the country and we are grateful to Sasol for creating an opportunity for us to interact with the kids,” said Janine van Wyk, Sasol Banyana Banyana Captain. “Sasol invests in creating shared values for communities by involving them. Sport, in particular football, is one of the fundamentals that unites people and we are privileged at Sasol to be involved in this spectrum with the South African Women’s National team,” said Henk Human, CSI and Sponsorship Specialist at Sasol. The Senior Women’s National team is holding their camp in the Vaal, preparing for their international friendly match against neighbours Botswana this Saturday 07 June at the Vaal University of Technology. Kick-off for the match is at 15h00.